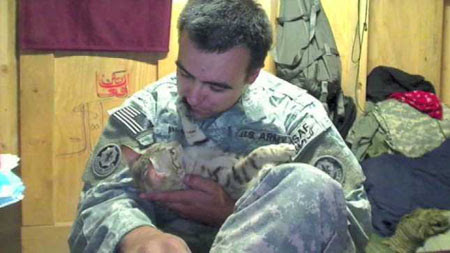 In case anyone had any doubt about the power of the purr, check out this story of a soldier in Afghanistan who saved a cat's life, only to find out that it was really the cat who saved him. When Staff Sgt. 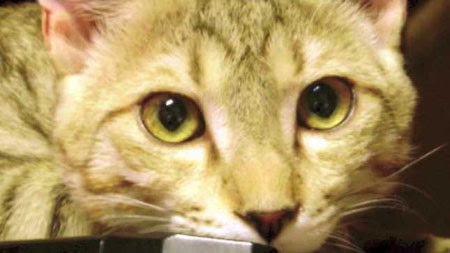 Jesse Knotts met Koshka as a feral, yet friendly kitten, he immediately fell in love with the cat, but worried about him being mistreated. Despite restrictions on soldiers having pets, he made room for Koshka in his small office, and took comfort in the kitty who reminded him of home. The pair's bond deepened in 2011, after a suicide bomber attack that killed two of the seargeant's friends. While mourning the loss, Koshka came and climbed into his lap, willing him not to give up. "I'd lost hope in myself. I'd lost faith. Then all of a sudden this cat came over and just reminds me ‘hey, you are you,'" Knotts said. Knotts knew he had to bring Koshka home to the U.S., but since he was unable to get the cat on a military convoy, he had to find another way. 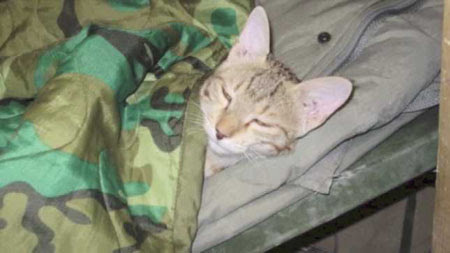 A local interpreter offered to transport the cat to Kabul, a dangerous proposition, considering that if he was caught by the Taliban doing a favor for an American, he could be killed. After weeks of what must have been nerve-wracking waiting, Koshka eventually made it safely to the city, where Knotts's parents paid $3,000 to have the cat flown from the Middle East to their home in Oregon. Knotts is currently finishing out his time in the military, but visits Koshka whenever he can. "He was my saving grace. He kept me alive during that tour," he says. Wow that an amazing story! I'm so glad they found each other! You can tell how much the cat meant to Knotts and his family when they paid so much to bring it home! Koshka is a beautiful cat with eyes that seem so wise. What a lovely story. For other soldiers, it's worth knowing about Nowzad Dogs, who despite their name help with cats too. Anyone can be heroes at their own ways. This feline is a living example of that. Beautiful story - they rescued each other!